Open to ADTA yearly members. Download and print these RSO Training Documents - bring them to the class. Every ADTA event involving firearms; from dry-practice seminars to live-fire range exercises; requires the presence of attentive, knowledgeable Range Safety Officers (RSOs) to help ensure the safety of all participants. The ADTA has developed its own Range Safety Officer program, focusing on semiautomatic pistols, revolvers, and supervising the safe execution of the defensive techniques frequently conducted at ADTA events. Participation in this program is free to current ADTA members. The ADTA, as an organization, is actively recruiting interested Range Safety Officers. ADTA Range Safety Officers return the service to our club by agreeing to volunteer as an official ADTA RSO for one or more of our approximately twenty events each year. Participants should be familiar with the operation and comfortable handling of semiautomatic pistols and revolvers. Prior range safety officer training or equivalent experience is a plus, but not required. 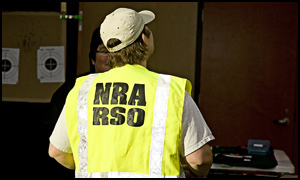 NRA-certified RSOs are welcome to audit and help us refine this course; as policy, the ADTA recognizes any NRA-certified RSO as an appropriate RSO for ADTA events. This course is taught by ADTA member Ron Bowen an NRA-certified Range Safety Officer, and supported by several other ADTA members who have completed the ADTA-specific Range Safety Officer certification. This two-part course is conducted as a morning presentation session (participants may keep a copy of all the course material for reference), a break for lunch (provided, or bring your own if you prefer), and a series of scenarios in which you'll be expected to assume the ADTA RSO role and responsibilities as we engage you with both common situations and complications you may encounter.